Garlic flakes represent a dried or dehydrated form of garlic, which has been minced or sliced into flakes previously. Garlic is also known under the scientific name allium sativum and it is related to other intensely flavored aliments, such as onion. As both a spice and a healing element, garlic used to be one of the staples in the Galen culture. Garlic is used for its bulb, which contains an intensely flavored essence. Garlic has various nutrients, such as C and B vitamins, which help the organism to digest well, quick, calm pains, accelerate the metabolism and tone the body. Garlic is better to be consumed fresh, but garlic flakes also keep these valuable nutrients that generally provide good health for the organism. 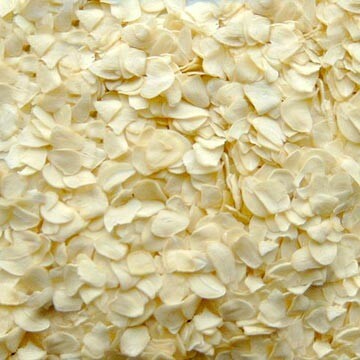 Garlic flakes are used in various recipes, such as soups, sauces, stews or as a seasoning for meat dishes. Basically, garlic flakes are used instead of garlic, in meals which require the same flavor, but not the same texture as the one belonging to the fresh garlic. 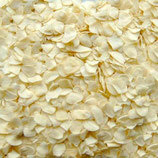 It is available in 100g and 500g.